Mangroves and shipwreck in the Ramsar Nature Reserve. 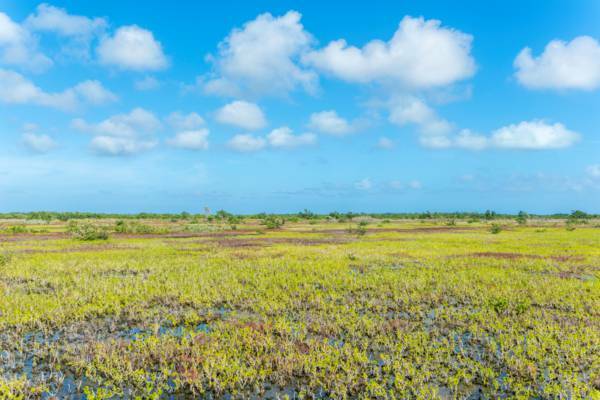 By far the largest protected area in the Turks and Caicos, the 134,400 acre (54,390 Hectare) Ramsar Nature Reserve covers the majority of the southern wetlands of North and Middle Caicos, and a small region on East Caicos. An ocean of red mangroves. On the whole, wildlife density in the expansive wetlands of the Ramsar site is lower than at many smaller protected wetlands in the country such as the Northwest Point Pond Nature Reserve on Providenciales, or the Princess Alexandra Nature Reserve, yet the sheer size and general inaccessibility of the Ramsar site is what makes it so important; it provide a significant buffer against wildlife populations reductions. An example of this is the uncontrolled and illegal poaching of giant blue land crabs, conch, turtle and sharks in the Frenchman’s Creek Nature Reserve, Chalk Sound National Park, and Northwest Point Pond Nature Reserve. Due to their limited size, these protected areas on Providenciales can be seriously impacted by poaching. The southern side of this nature reserve near Middle Caicos is adjacent to the impressive Ocean Hole and Vine Point Nature Reserve. Signed in 1971, The Ramsar Convention is an international treaty for wetland protection. Over 2,000 sites found across more than a hundred countries are recognized under the agreement. The Turks and Caicos Ramsar Nature Reserve was formed in the early 1990s, and was the first such protected area in a British Dependent Territory. The open plains of the Ramsar Nature Reserve. The landscape of the Ramsar site is beautiful yet relatively unvarying. 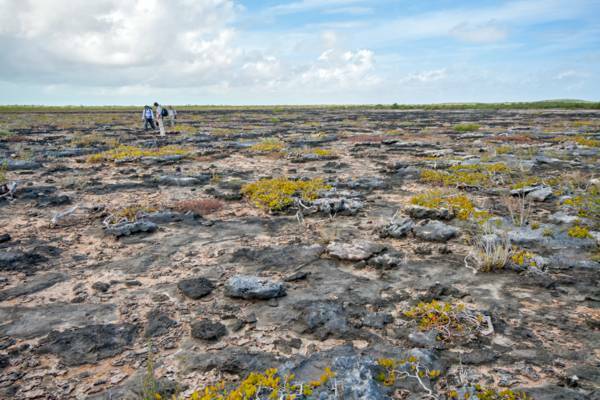 On the far northern inland regions on North, Middle and East Caicos, a flat saline mud and rock plain can be found. The rock exposed here is soft marine limestone bedding, generally with an eroded and decayed surface. The limestone is also quite porous, with ample evidence of initial stage Karst water lens systems in places. Barely above sea level, these plains are largely submerged during spring tides and storm surges. The contrast between the North and Middle Caicos flats and the East Caicos flats is interesting. Although currently uninhabited, past industries on East Caicos introduced donkeys to the island, which continue to thrive to this day. The East Caicos flats have a spider-web network of donkey paths worn into the ground, paths that lead to life-giving water sources, and the forage and shade of small vegetation “islands” in the marine plains. At a few inland spots where salinity levels are relatively low, a scenic terrain of sabal palm and sawgrass can be found. An important habitat for bird life, the giant blue land crab and other species, an expansive band of red mangrove forest makes up the majority of the central regions. 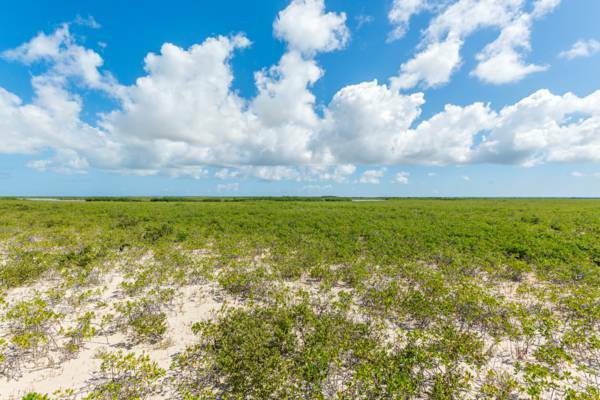 Although quite dense, the mangrove height of the majority of the Ramsar site isn’t quite up to what can be found at a few select sites on Providenciales and East Caicos. Vast and complex networks of mangrove-lined channels lead from the shallow Caicos Banks inland. These creek-like waterways are carved by normal tide movement and gradually taper off in size as they progress into the interior. Caribbean flamingos (Phoenicopterus ruber) in the Ramsar Nature Reserve. As would be expected, the Ramsar Reserve is home to wide array of wildlife. Probably most striking is the number of green turtle found in some of the channels. Water visibility in the interior is typically quite poor, yet turtles can be seen breaking the water surface as they ascend for air. Sharks, usually of the lemon variety, are also common. Bird life includes green herons, tri-coloured herons, yellow-crowned night herons, reddish egrets, great blue herons, mangrove cuckoos, and inland, Antillean nighthawks. In early 2016, changes were proposed to the Turks and Caicos National Parks Ordinance, and both the protected area boundaries and governing law of the Ramsar Nature Reserve will likely be affected. Proposed changes include removing portions of shallow Caicos Banks water from the southern side of the nature reserve, adding regions of the East Caicos wetlands, adding one of the East Caicos caves, and possibly adding the historic ruin site of Jacksonville. Another general policy change proposed is to allow catch-and-release sport bonefishing in all nature reserves and national parks in the Turks and Caicos. 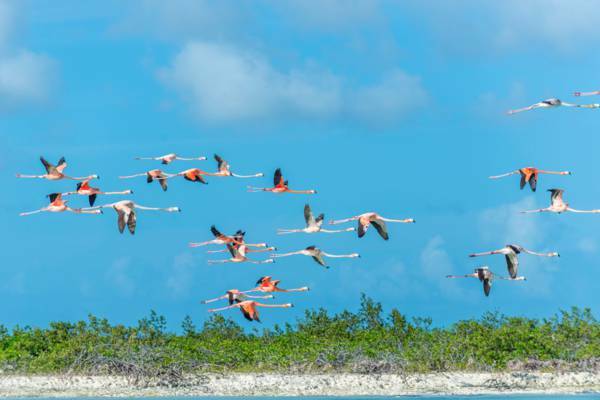 There are no organized tours or trips into the remote Turks and Caicos Ramsar Nature Reserve. Road access does not exist, and the only tourism use of the region is off-the-grid kayaking expeditions and bonefishing. Kayaking and stand up paddling boarding access typically take place either on the far western end of the nature reserve (nearest Providenciales), or at Bottle Creek Mouth near the North and Middle Caicos Causeway.